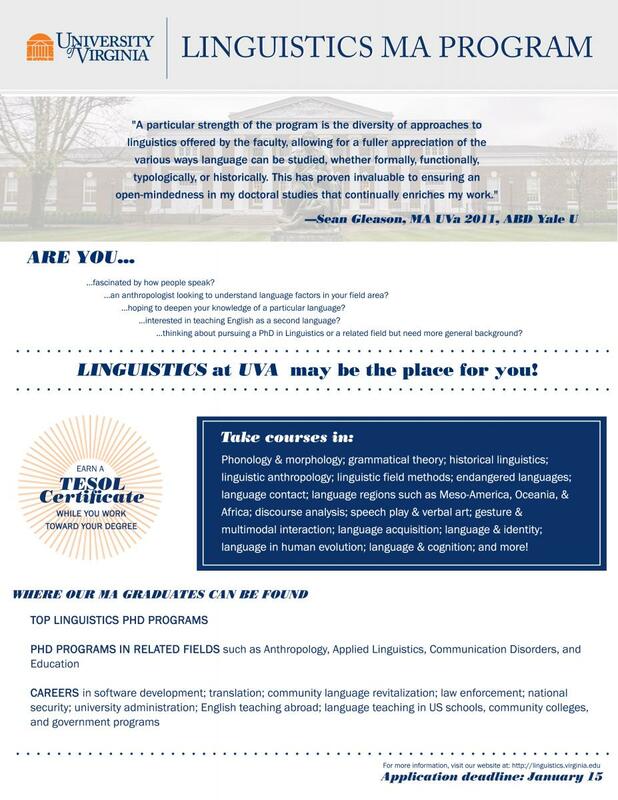 MA Program | Linguistics Program, U.Va. The Program in Linguistics is administered by the Interdepartmental Committee on Linguistics, which makes all decisions on admission. The purpose of the program is to provide training in general linguistics. Students are encouraged to focus their studies in a particular area such as anthropological linguistics, TESOL, or an individual language or language family. Graduates of UVa's Linguistics M.A. program place in top Ph.D. programs. Those pursuing Ph.D.s in Linguistics have moved on to programs at Northwestern, Penn State, University of Michigan, University at Buffalo, University of llinois at Urbana-Champaign, University of California Santa Cruz, Yale, and elsewhere. Others have moved on to Ph.D. programs in other fields, such as Communication Disorders, Education, and Anthropology. Graduates of the program have also found employment in such diverse areas as translation; national security; law enforcement; software development; English teaching abroad; language teaching in US middle schools, high schools, community colleges, and government programs; community language revitalization; and other fields. All students take LNGS 7010 (Linguistic Theory and Analysis). They also take one course in historical linguistics, such as ANTH 7480 (Language and Prehistory) or CLAS 5300 (Introduction to Indo-European Linguistics). They must also take at least one linguistics course that focuses on the structure of a language or group of languages. Courses fulfilling this requirement include ANTH 5401 (Linguistic Field Methods), ANTH 7450 (Native American Languages), and LING 7400 (Structure of English). The final requirement is a course in theoretical linguistics, either a survey course comparing various theoretical approaches to language such as ANTH 7420 (Theories of Language), or a course focusing on one of the subfields of linguistics such as phonology or morphology. The required courses count for 12 of the 30 credits needed for the degree. The remaining courses, making up the remaining 18 credits, are Linguistics electives in related fields (e.g., psychology, anthropology, philosophy, Romance linguistics, etc.) These are selected in consultation with the advisor. Each student must also take a comprehensive examination, the exact form of which is determined by the Committee on General Linguistics. Students may optionally elect to write a thesis after consulting on the timing and topic with their advisor. Before enrolling in the three-credit thesis writing course, LING 8999, students must submit a thesis proposal signed by two faculty members who have agreed to supervise the work. Before graduating with the M.A. in Linguistics, students must demonstrate reading competence in a language other than English. Normally, this language is French or German. Other languages may occasionally be substituted by petition to the Linguistics Committee. B.A. degree or equivalent from an accredited university; and a writing sample (in English), preferably on a linguistics or language-related topic. The writing sample should be a sample course paper or other essay that shows your ability to frame a scholarly argument, discuss writings by others, and develop and support your view with appropriate instances. Students normally enter the program in the fall semester. Spring admission will be considered in exceptional cases only. Applications are due on January 15 for admission the following fall. For questions about the application process, please contact the Graduate School of Arts and Sciences Admission office. For questions about the Linguistics Program, please contact Linguistics Program Director Lise Dobrin. For information about tuition, fees, and financial aid, please see http://graduate.as.virginia.edu. Prospective students applying to the Linguistics M.A. program may also be considered for a Teaching Assistantship. From time to time financial support is also available through the English as a Second Language program or through work-study. New Zealand cinema often represented Maori people as an exotic background to a paradisaical country while Pakeha were represented as heroic protagonists helping progress a backwards nation. Until recently the national film industry was almost entirely Pakeha run. Consequently, there is a dearth of Maori presence in all industry positions. However, since the Maori cultural revolution there has been progress in Maori cinematic presence which has spurred the creation of Maori-produced media. Their presence has slowly put cinematic representation into Maori hands. Language is especially important in these productions as the Maori language has declined and Maori English has gained new importance as a cultural identity marker. In this study, I examine language use in two Maori directed films, Ngati (1987) and Hunt for the Wilderpeople (2016), to understand how diverse Maori identities and dominant messages are supported. I achieve this by using Third and Fourth cinema theories. Film analyses of these two films have not included language and this study adds a new perspective in the analyses of both films. This study found that language is used to express Maori identity and support the dominant messages of Maori self-determinism and post-colonial critique in Ngati (1987) and Hunt for the Wilderpeople (2016). In conclusion, language is an overlooked and important aspect of Maori produced media which, once taken into account, reveals salient connections between diverse expressions of Maori identity, linguistic choice, and dominant messages in each film. This study examines the lexicon, stance attribution pronouns, and non-linguistic semiotic features of Food and Health segments on the Today show. The features of these two registers, Food and Health, present contradictions between desired comfort/nostalgia foods and beneficial (but undesirable) healthy foods. Food presentation in the media of this nature mark healthy lifestyle choices as separate from and less preferable to regular foods. By discussing the differences and contradictions among the linguistic and paralinguistic features of food discourse on the Today show, I conclude that a more holistic understanding of nutrition, and its corroborating linguistic register of Nutrition, can recalibrate America's understanding of food to be both desirable and beneficial. Southern French, also called Meridional French or Français du midi, has been recently recognized as a language variety separate from Standard French which deserves to be studied on its own. Nevertheless, it can be helpful to discuss Meridional French by contrasting it with Standard French, most notably by drawing attention to phonological differences between the two language varieties. Meridional French differs from Standard French in its pattern of mid vowel alternation, the common penultimate stress in lexical items, a preponderance of schwa resulting in mostly open syllables, the presence of post vocalic nasal consonants, and the existence of true diphthongs. All of these elements can be explained, with a high degree of predictive power, by examining the situation of language contact in the South of France, which has existed for at least 300 years. According to this proposal, the suprasegmental structures present in Provençal, the foot and the syllable, were transfered intact into French at the time of this language’s introduction into Provence. Such an analysis, which compares three languages, and examines a situation of language contact, takes advantage of both synchronic and diachronic methods in order to explain a purely synchronic phenomenon. The analysis is both theoretically informed and cognizant of language’s social situation. The thesis explains the source of the major differences between the two varieties of French in a simple and straightforward manner, while also shedding light on strictly synchronic problems that have previously occupied linguists interested in Meridional French. Dholuo, spoken by the Luo people of Southwestern Kenya and Northern Tanzania, is known to have a complicated pattern of plural formation that is in many ways unpredictable, and published sources differ on the description of this phenomenon. This paper reconsiders the problem through the analysis of new data, taking into account likely patterns of historical inheritance. Data were obtained from a native speaker of Kisumu, South Nyanza dialect, whose pronunciation of 340 lexical items items (170 nouns and corresponding plural forms taken from Odaga’s 2005 Dholuo-English dictionary) was digitally recorded in June 2007. Synchronically, plural formation can be considered an affixation of one of two plural morphemes (-ɛ or -ni), with the precise pattern subject to regional variation), according to syllable structure. But historical considerations suggest that these morphemes may derive from an earlier number marking system that was based on three conceptual number categories (singulative, singular, plural) rather than two (singular, plural). The findings suggest that Dholuo number marking is more conservative than any of its siblings.